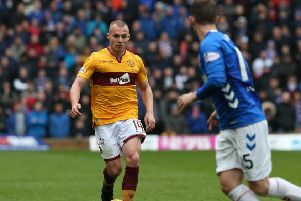 Motherwell return to Scottish Premiership action this Saturday in a Lanarkshire derby at Hamilton Accies which kicks off at 3pm, writes Craig Goldthorp. The Steelmen were idle last weekend as the William Hill Scottish Cup semi-finals were played and they were knocked out 2-1 at home by Ross County in the fourth round of this year's tournament back in January. Eighth placed Motherwell – who have 43 points from 33 league games this season – start at a best price of 6/5 favourites to beat a 10th placed Accies side (available at 13/5 to win with some firms) who are still desperate for points to stay above the relegation zone. Motherwell won 2-1 on their last visit to Hamilton on December 29. Dougie Imrie put the Accies ahead before a stunning double by ’Well defender Tom Aldred got the visitors three points. Motherwell also saw off the Accies 3-0 at Fir Park last month thanks to goals by David Turnbull (2) and Jake Hastie.